A few weeks ago I went shopping for business casual shoes. You know, ones that you can wear to work on casual Fridays with jeans? After checking out numerous stores at the mall I soon discovered that those shoes don’t exist anymore, they’ve all been replaced by boat shoes. Even if my anger at this is misguided, I pin most of the blame squarely on Vampire Weekend. The Paul Simon Graceland indebted band burst out of New York in early 2008 with their self-titled debut and while song titles such as “Cape Cod Kwassa Kwassa” made them an easy target of cynical music critics, it was hard to ignore the hooks that drew in many fans. VW deftly sidestepped the sophomore jinx with the even better Contra featuring the undeniable single “Giving Up the Gun”. A little over five years after their debut, Vampire Weekend is back with Modern Vampires of the City. Leaving behind some of the more worldly aspects of their sound, VW instead goes for a bit more atmosphere on tracks such as “Ya Hey” and “Hudson”. Thankfully they retained their pop smarts which are expertly shown in the string of songs “Unbelievers”, “Step”, and contender for track of the year “Diane Young”. This may be best run of songs on any indie rock album released in recent memory. 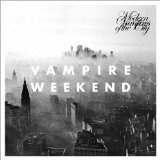 Somewhere music critic Jim DeRogatis is cringing at the thought but in Modern Vampires of the City, Vampire Weekend has released one of the best albums of the year.